GUMSHOE really became famous with the publication of Trail of Cthulhu, but Esoterrorists was the first game to feature these rules. 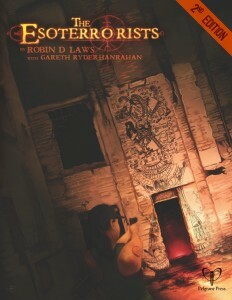 That was my reason for picking up this bundle: I was curious to find out what Esoterroists was all about. The premise of Esoterrorists is this: supernatural phenomena exist. Wherever and whenever humanity becomes sufficiently unsettled and frightened, and they start to doubt reality, the Membrane separating this world from the world outside – dramatically called the Outer Dark – starts to thin, and beings from outside can communicate, and can even be summoned into our world. And of course a bunch of people have decided that doing just that would be a great plan of action. These people are called the Esoterrorists, and they are a very disparate group of people who have the common goal of weakening reality, so the Outer Dark Entities (or ODE’s) can get through). If that was the end of the story, the prospects for humanity would be grim. Luckily, a number of people know about this and are trying to stop the esoterrorists. These people are members of a global, semi-official conspiracy called the Ordo Veritatis (OV). The OV is backed by several world governments, and many of their agents are law enforcement officers, crime scene technicians or similar for most of their lives, but ready to spring into service as OD agents whenever they are called. The game comes with a very particular structure for a game – even more structured than its little brother, Ashen Stars, has. Agents are called, meet up with each other in one place, then meet up with “Mr. or Mrs. Verity” (a generic cover name for a briefer) for their mission briefing. Then they go out, investigate, and neutralise anything they find. Then, before they leave, they conduct the “Veil-Out” – cleaning up the mess, removing evidence and disseminating a cover story for what happened. The last bit is important, because rumours of the truth would weaken the Membrane. Characters in this game are experienced and capable investigators, who have training from somewhere. That is reflected in character creation. Each character has two kinds of abilities (like in other GUMSHOE games): investigative abilities and general abilities. Investigative abilities deal with investigating – not just things like Evidence Collection and Forensic Accounting (yes, that is an ability), but also things like Impersonate and Intimidation that might not usually be considered as belonging to that kind of category. These abilities are not rolled – instead, you always get clues you have the right skills to get, and can spend points for better effects.. General abilities, on the other hand, are rolled, and deal with things like fighting, stealing things and being prepared. The antagonists fall in two categories: Esoterrorists, and ODE. Esoterrorists are people who are dealing with ODE and trying to break down reality. They are usually organised in cults, and there is a system for classifying both cults and members, to help you better detail them. ODE, on the other hand, are supernatural beings, inhabiting some form of biological, but strange, body. These are described with stats for what they do and how to fight them, and often also a drawing. The last half or so is an in-depth look at an example of an alternative kind of scenario for the game, called Duty Station: instead of being assembled to deal with one specific issue after another all over the place, this cell of OV has been stationed in a particular city, and will be trying to weed out the Esoterrorists hiding in the community. This section includes several fully fledged NPC’s. Also, while the book is peppered with little story seeds, this part has a whole scenario ready to go. My impression: I’m a bit ambivalent about this game. On one hand, it looks like a good setup for a really classic, straightforward supernatural investigation game. On the other hand, the game seems rather bland, particularly compared to many similar games. The game doesn’t really put the player characters in focus. Instead they are mostly just competent proxies for the players. There are no drives, player arcs or similar features in this game (as opposed to Ashen Stars, and also Trail of Cthulhu). Just characters and their abilities. This meshes well with many investigative games I played as a kid, where the story was the important thing, and the investigators were pretty flat. On the other hand, I think I might prefer having player characters with built in conflicts and personal goals that I can play with in the game. Particularly in a campaign game, where we’ll be hanging out with the characters for a long time. The scenario structure is also a little stiff for my taste. It meshes well with the premise for the game, with the very structured police-like agency of the OV, and it’s also a good help for quickly getting a game off the ground. On the other hand, it seems the different cases would feel disjointed, and I’m not sure whether a campaign would feel at all like a coherent story. The Duty Station setup seems more likely to accommodate a cohesive story. Not only will we be dealing with many of the same NPC’s over and over, and to some extent the same enemies, the player characters will be living in the community of these NPC’s, so anythings that happens will hit much closer to home. On the other hand, I do quite like the way the game introduces the antagonists. The human antagonists are presented as real humans, and asks the GM to consider the history and motivations of the NPCs. In many of these kinds of supernatural investigation games, there is a tendency to skim over the reasons for the evil foe being evil. It’s good to have a game encouraging the GM to make their antagonists into whole and believable characters. The ODE’s are also well designed. They are weird creatures, but have a distinctly unique feel, different from Cthulhoid horrors or other “creatures from beyond” that would help Esoterrorists stand feel different than other, similar games. Ultimately, though, I’m not sure this game is for me. I don’t have enough interest in police procedure, and I would prefer characters with a bit more flesh to them. How would I use this: I could see myself using this game for one-shot investigation games, particularly if I ever went back to teaching adolescents. I could also be persuaded to run a short campaign of Duty Station – I could see it as a great basis for a game that is part Twin Peaks, part X-Files and part undercover police drama. Other than that, I might lift the Esoterrorist creation chapter in a Cthulhoid game, when creating the cults that are summoning the horrors from beyond.